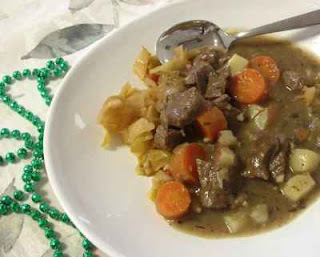 St. Patrick's Day festivities will soon be upon us and thanks to this week's column at Kitchen Parade, you're prepared! It's a recipe for beef stew from my long-time friend Lisa, always an inspired cook. She serves the stout-spiked stew recipe in bread bowls. In or out, it's delicious! This year I'll be remaking my long-time favorite caraway corned beef, cooked with potatoes, carrots and cabbage topped with cheese sauce. Yummy. Kitchen Parade offers up other ideas for special foods for St. Patrick's Day, whether traditional favorites or 'green food' specialties. DON'T YOU LOVE THE INTERNET? If a Swiss woman who lives in Spain can sponsor a St. Patrick's Day food blogger event, then it must be acceptable for an American cooking Irish to enter? Many thanks to Zorra from Kochtopf for hosting the party!